One of the most famous novels of all time comes to life in the stunning adaptation of War and Peace. 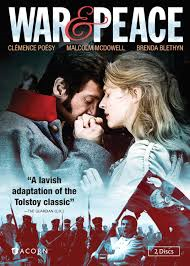 This four part miniseries, based on the novel by Leo Tolstoy, was filmed in 2007 and stars Clémence Poésy as the somewhat spoiled Natasha Rostova, and Alessio Boni as the army officer Prince Andrej Bolkonsky. The program has been broadcast in Belgium and France, but made its US debut on "Best of British TV" streaming online from Acorn TV in July of this year. The DVD is available on Sept. 24. The story begins with preparations for a big party in celebration of Natasha Rostova's name day. The Rostova family has three children, including boys Nikolaj (who is anxious to go off to war) and young Petja, who idolizes Nikolaj. During the party, Natasha sees (and instantly falls in love with) Prince Andrej. Andrej is married, but his not happy with his pregnant wife Lise, and tells anyone who will listen about how he's "trapped" in his marriage. A Rostova family friend, Pierre, arrives from Paris before the party begins. Pierre has spent most of his recent time carousing with his dissolute friends. 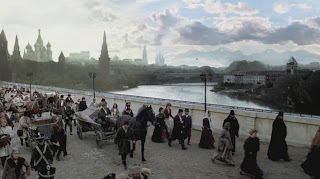 Although illegitimate, Pierre arrives at his dying father's bedside just in time to be named heir to the estate and to inherit the title Count Bezukhov. The financial advisor Kuragin, who had been expecting to take over the estate, fumes, but luckily, he has a pretty daughter, Helene. Helene didn't have much time for Pierre before he became wealthy, but she finds him much more interesting after the death of his father (isn't that always the way?). 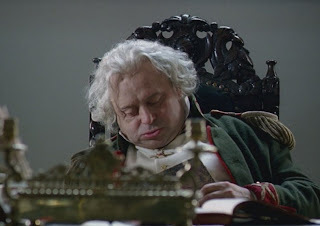 While Natasha is entertaining her guests by playing the piano at the party, a messenger rushes in with the news that Czar Alexander has decided to join the Austrian Emperor in declaring war on France. Napoleon has been marching his vast army toward the east, and the Russian men are all thrilled at the chance to join the battle. Before going off to war, Prince Andrej leaves his wife Lise at his family estate. Andrej's father, played by Malcolm McDowell, is a horrible person -- mean, gruff, opinionated, socially inept, and disrespectful toward his children. He makes sure that Andrej knows it doesn't matter if he's killed in the war -- so long as he doesn't bring shame on the family. After Czar Alexander and Napoleon declare a truce, Andrej returns home. His wife has died and that leaves him free to become engaged to Natasha (funny, since before he was eager to leave the prison of marriage behind!). His father once again shows his controlling nature by demanding that Andrej wait a year to be married. Things are heating up on the Polish border, and he has volunteered Andrej to go and advise the army there. Natasha is unhappy, but declares she will wait the year for her true love. Pierre has married the scheming Helene, although the marriage is not happy. He wants to spend his time visiting the serfs on his vast estates and helping them to have better living conditions. Helene's life is a series of parties and social events, and her shameless behavior leads the normally docile Pierre into a duel. Natasha visits Helene and criticizes her for not doing more to stop the duel. Meanwhile, Helene's brother, the slimy Anatole, has been forced to marry a peasant girl by Andrej, his superior officer. Because of this, both Helene and Anatole have reasons to want to see the relationship between Natasha and Andrej destroyed. Events at the front have kept Andrej away for more than the original year, and Natasha begins to despair that they will ever get married. This makes her an easy target for the handsome, but unscrupulous, Anatole. Eventually, the peace is once again broken and the French invade Russia and begin their march toward Moscow. The wily Russian General Kutuzov knows his men are out numbered, so instead of engaging the French in battle, he has them constantly retreat and burn anything that might aid the French. He knows that as the French are drawn further into Russia, without adequate supplies, the will of the French to fight will be greatly reduced. His attitude enrages the Czar and most of the soldiers, but he has no will to see his army massacred. As the French advance, terrified citizens flee from Moscow. For some reason I never really understood, Pierre demands to be taken to the front to see the war firsthand. Of course he's something of a spectacle in his dapper clothes amongst all the chaos and misery. 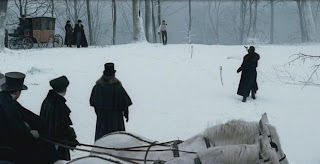 He is on hand when Andrej is wounded in battle, and so agrees to help Andrej get back to Moscow and Natasha. The story continues with fortunes lost, old loves betrayed, new loves met and unpleasant people getting their comeuppance. Napoleon is sent back to France, never having achieved his dream of "bringing culture and civilization" to Russia. Oh well. I had never read the novel before, but I did have the impression that it was filled with so many characters it was hard to keep up with everyone. 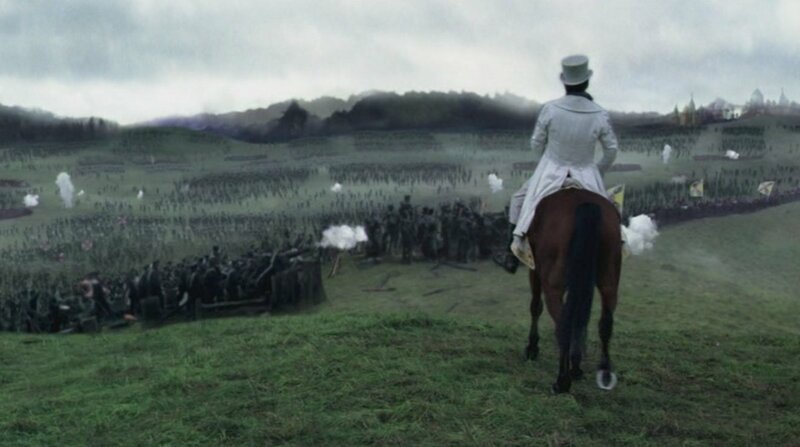 The film wasn't quite that bad, although the extra feature "War & Peace by the Numbers" does state that there were 15,000 extras used in the filming. There were an awful lot of troops seen marching on both sides! The extras also mention that the beautiful interior shots were filmed at the Russian imperial palaces of Peterhof and Pushkin in St. Petersburg. I must admit, I had a hard time with all the Princes, Princesses, and Countesses. It was a bit strange that Andrej's father made such a fuss about Natasha being from a low-class family, when she was a Countess! Of course, he wouldn't have been happy with anyone, but surely the Rostovas weren't much lower on the social scale? All the houses looked quite splendid, everyone had servants, and they were forever packing up and moving back and forth between country and city houses. It was all a bit confusing and hard to figure out the pecking order. Overall, the settings were beautiful and all the battle scenes were impressive. I thought the historical information was presented in an interesting manner, and I really enjoyed the Russian General Kutuzov, who was able to win the war by retreating. A brilliant military strategist, for sure!